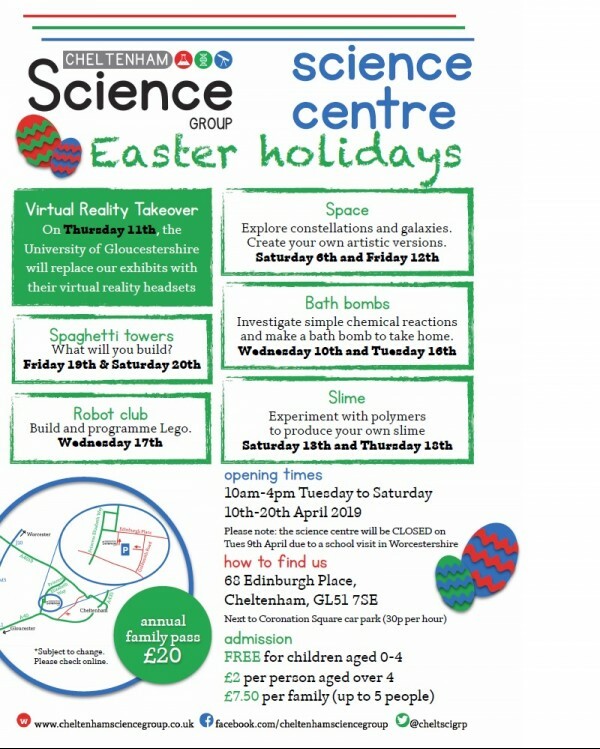 The science centre in Coronation Square, Cheltenham will be open from 10th-20th April during the Easter holidays with a number of different activities, including: slime, bath bombs, spaghetti towers, space craft and robot club. In addition, we are very excited that on Thursday 11th April 2019, the University of Gloucestershire will be taking over the science centre and replacing our hands-on science exhibits with their virtual reality headsets. We know that many families will use their annual family pass to visit more than once during the holiday: the pass costs £20 and gives a family of five unlimited entry to the science centre, including any special events, for 12 months. The science centre is open from 10am until 4pm and costs £2 per person over for or £7.50 for a family of up to 5 people.